India this year completes 75 years of playing international Test cricket, a game that is almost a religion in this country of one billion and has simply overshadowed every other sport in passion and popularity. Led by the redoubtable Col. C.K. Nayudu, an Indian team stepped on to the hallowed turf of Lord's on June 25, 1932, to face the then mighty England and was soundly beaten in the three-day Test series despite the heroics of pacemen Mohammad Nissar, Amar Singh and Jahangir Khan. From humble beginnings when cricket was still considered a game of the elite, cricket is today perhaps the only sport that can bring the country nearly to a halt - more so if India is winning! "It is quite a big moment for Indian cricket," says former Indian skipper Bishen Singh Bedi of the anniversary. "I wish I could be on the field even this time." From a pastoral pastime on the English village green, cricket was spread worldwide by the British colonialists and lapped up by erstwhile rulers of princely states in India as a means of interacting with the officers of the Raj. The princes batted as the toiling minions bowled their hearts out. The Maharaja of Patiala even built a cricket ground in Chail in the northern state of Himachal Pradesh. Till date it remains the highest ground in the world where first class cricket has been played. Today, Indian cricketers jostle with iconic film stars for advertising and TV space and on their shoulders ride billions of rupees in marketing a slew of products ranging from motor vehicles to hair care formulas. It's a game that has seen the coffers of cricket boards of 10 Test-playing nations swell, the Indian board being the richest of them all. TV rights alone have been sold for billions of rupees and associated marketing of the game has ensured that cricket is firmly entrenched in the minds of the millions that passionately follow the game in India. Cricket is primarily played in white clothing and a red ball, often referred to as the 'cherry', over several days quite often without a definite result being achieved. Obviously this was just not good enough to capture the imagination of the masses. The advent of the shorter limited overs game, usually completed in a single day, also brought with it coloured uniforms for players and white balls. One-day internationals (ODIs) soon began to be played well into the night under arc lights. The credit for this innovation must go to the Australian media mogul, late Kerry Packer, whose rebel series did not make money but cricket was never the same after his entry. India has played 405 Tests before the England tour this summer but the country's dismal record away from home remains a cause for worry. Of the 198 Tests India have played abroad, it has won only 28, lost 84 and drawn 86. Overall it's been a paltry 90 wins and 131 losses. It was not until February 1968 that India won its first Test match and series away from home shores. Young captain Mansur Ali Khan Pataudi marshalled his resources well on the tour of New Zealand, also heralding the arrival of India's spin wizards E.A.S. Prasanna and Bedi. India went on to beat New Zealand 3-1 in a four-Test series. "In all these 75 years, there have been two outstanding players, Col. Nayudu and Tiger Pataudi. I never saw Nayudu play but heard a lot about him as he is a legend in Indian cricket," Bedi recalled with a touch of nostalgia. "Tiger's contribution to Indian cricket can never be forgotten. He never made us feel that we were from Punjab, Bengal or Maharashtra. For him it was always India. 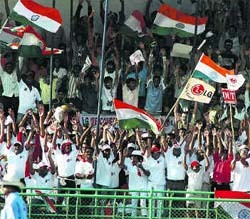 "Indian cricket has come of age. Now there is loads of money. But money can't replace the talent," the left-arm spin legend said. "Having completed 75 years, the infrastructure needs more attention. The level of domestic cricket has also gone down." Over the years, the game has become a huge commercial success as marketing experts latched on to the tremendous recall value of the players to push their products. "It is a great achievement on part of the BCCI (Board of Control for Cricket in India) that once didn't have any money at all and now is the richest cricket board in the world," former India opener Chetan Chauhan said. "Cricket has been streamlined and it has been commercialised, which has also led to the spread of the game," he added. However, there has been a flip side to commercialisation. Test cricket, though it still retains its charm for purists, has been relegated to a secondary status behind the limited overs version of the game. Now, the introduction of the Twenty20 format at the international level could further erode the popularity of Test matches. "One-dayers may bring in the moolah but it's Test cricket that remains the real thing," said the legendary Sunil Gavaskar, who scored only one ODI hundred compared to 34 Test centuries, apart from becoming the world's first batsman to score more than 10,000 Test runs. "It's time to reflect on the past and learn the lessons. "Young players should strive to perform at the Test level before looking for success in the shorter version of the game. It's not a good thing that the reality is the opposite," Gavaskar, a member of the 1983 World Cup winning squad, told IANS.